My Fair Assassin by C.J. Anaya is the first book in the Paranormal Misfits series. Crysta lives every day trying to fit in and make it to the next day. She dyes her naturally white hair so she'll look like a typical teenage girl. She even had herself emancipated to avoid any more foster families. Add on her weird ice abilities, her weird eating habits, and this weird trend of any man that she meets becoming stalkerish and obsessive; she's definitely not like everyone else. Then a man breaks into her apartment with the intent to kill her, but curiosity compels him to know more and to protect her. She thinks he's insane, but he insists that there's more to her than she thinks. C.J. Anaya creates a fantastic and unique take on the Fae myth! My Fair Assassin is funny, clever, witty, romantic, with a strong and real heroine in Crysta. She has a dark and tragic back story, but her insecurities make her easy to relate to, a real person with real issues. Her internal dialogue makes her instantly likable. The play with language is fun and delightful. Crysta uses specific phrases that are common to us, but to Jareth (the man that breaks into her apartment), it's strange and confusing. Their banter often leads to a humorous place, like him thinking the phrase “throwing in the towel” means to literally throw a towel. My Fair Assassin is a quick read that leaves you begging for more! The end is clearly just the beginning. I can't wait for the next book! This was an entertaining book! Right from the beginning, I already love all the playful banters between Jareth and Crysta. Jareth was also drool worthy with his white hair and green leather outfit. Gotta love these Fae men, they just know how to look masculine and feminine at the same time. -Meet more characters (good/bad guys). -See the Fae realm (seelie/unseelie court). -Crysta growing stronger with her power. -More backstory on Crysta's past. -More of Jareth wooing Crysta. -Crysta making new friends or a best friend. Overall, I love this book! I would highly recommend for those who loves Fae/Fey/fairies. This book is similar to The Iron King by Julia Kagawa and The Gifted Thief by Helen Harper. I enjoyed this Paranormal/Fae novella, and was surprised by it. Not that I was surprised by the writing from the author, I have loved everything I've read by her. But I've seen this book for quite a while on Amazon or on the author's Goodreads page when looking at her books. I just wasn't sure what to think(I enjoy fantasy and magic and the Fae realm) but I finally picked it up as I am getting ready to read an ARC of the 2nd book in the series to review. I didn't want to be in the dark on what is happening. I actually thought it would start at a different point in Crysta's story than it did but from the first couple paragraphs I was hooked. As readers, we're introduced to the two main characters, Crysta and Jareth(anyone else instantly think Labyrinth like me????) right away. Sometimes it takes reading several pages into a story to get the feel for the characters. For me I instantly liked them, especially Crysta, and I felt that opening was a great foundation for their development individually and as a couple. There's a mystery surrounding Crysta and she has struggled her whole life to fit in. I really liked her character's personality. You get a pretty good understanding of what her life was like growing up in the first little bit of this novella and let's just say it wasn't pretty or easy but very lonely. Yet I loved the resilience of her character and her ability to adapt and find something she loved and aim for achieving it regardless of the struggles. Jareth has some mystery surrounding him(which is all revealed in time) and I'm not going to say anything about that, I'll let you enjoy the unraveling of that mystery as you read. I will say that the sparks and chemistry between him and Crysta creates pure fireworks! Danger, mystery, hidden identity, assassins, knock you to your socks reveals(at least for Crysta), sparks, great wit, strength, Ihop (let you figure that one out too), white, infinity, ballet, stalkers, and so much more inside this little novella. Content: a couple mild swear words scattered throughout, talk about stalkers, reference to some attacks(sexual and nonsexual) but nothing explained or graphic you just know that they almost happened. A couple mild innuendos. Overall I would say it's a clean read and would recommend for older YA readers. If you haven't read any books by this author, I highly recommend any of them. I especially loved her The Healer series. The first book is free here on Amazon or the box set of the first 3 books is $1.99. One of my favorite YA Fantasy series! I am pleasantly surprised by how much I liked this book. 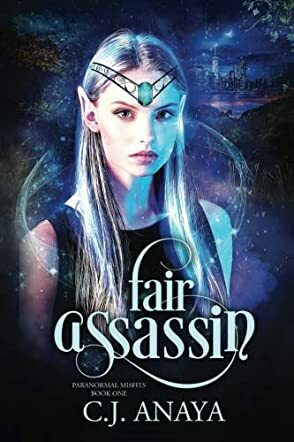 When you pick up a book about a girl beyond down on her luck and a Fae assassin ready to end it all for her, but at the last minute finds something intriguing about her that stays his hand, you expect the rest of the book to be about how she falls in love with a dreamy Fae. I always get to that point and wonder how she never questions that Faeries are real and she is now in love with him. I think that is why I loved this book so much. It takes so much for Crysta to believe a world of myths and fairy tales could be real. The story was logical enough that it never had me wondering how Crysta makes that leap of faith. It is clear and it made this a wonderful book. I recommend it to anyone who even thinks it sounds interesting! The author, C.J. Anaya, gives us a story blending Fae and human traditions together. The story tells us about the human life of a Fae who was switched at birth with a human and within 6 months her "parents" and all who were sent to protect her were killed. Because of this, Crysta felt she was an unloved foster child. After 17 years an assassin is sent to kill her. I've just told you the beginning and end of the story. It is up to you to get the free novella and read a good story.